Wright State’s Homecoming Week begins Sept. 29 with a kickoff party for all students in the Student Union Atrium and concludes Oct. 4 with fun activities, club football and soccer games, the Chili Cook Off and the Homecoming Dance and Casino Night. A flurry of activity will overtake Wright State University in celebration of a spirited Homecoming Week. From Sept. 29 to Oct. 4, students, alumni and friends are invited to don their brightest greens and golds and participate in each event throughout the week. Jack Pence, assistant director of student activities, said this is going to be the best Homecoming Week to date. Homecoming Week officially begins on Monday, Sept. 29, at noon, with a Raider Homecoming kickoff party for all students in the Student Union Atrium. Abound in food, fun and Raider pride, the kickoff event is not something to miss. The 2014 Homecoming royalty court will be announced, and students may cast their vote for next year’s Homecoming court. The same night, from 9 p.m. to midnight, at Beaver-Vu Bowling, join the student organization Black Men on the Move for free bowling. On Tuesday, Sept. 30, from noon to 4 p.m., students can participate in the Little Free Library Challenge. Student organizations will re-purpose newsstands into miniature free libraries that will be placed in neighborhoods where school-age children and their families can exchange books. On Wednesday, Oct. 1, from 7 to 9 p.m., the Wright State community is invited to enjoy a wondrous night of magic in the Student Union Apollo Room. The magic show is hosted by the Black Student Union. On Thursday, Oct. 2, from 11 a.m. to 2 p.m., Wright State will host the fourth annual Wright Brothers Day to celebrate current and past Dayton innovations. Participants will learn about the Wright brothers and the flight that changed the world. Exciting activities such as a selfie station, flight simulators and a Jeopardy game with interesting Dayton facts will be at the event. Attendees can also enjoy free Jet’s pizza. That evening, Wright State invites students, staff, faculty and alumni to enjoy a Homecoming Week classic: the Cardboard Boat Race and Pool Party. From 6 to 9 p.m., teams of students will construct a cardboard vessel in the Student Union Atrium. Teams will then bring their boats to the Student Union pool to put their creation to the test: a race against the other teams’ boats. On Friday, Oct. 3, Homecoming Week goes into high-gear with a smorgasbord of fun events. The day starts with Project ASPIRE from noon to 4 p.m. in the Student Union Atrium. The event is a career exploration fair in which alumni return to campus to talk about their jobs, employers and majors that got them to where they are today. From 6 to 8 p.m., the Wright State Alumni Association will celebrate the accomplishments of all Wright State alumni during the Alumni Achievement Awards. Friday’s Homecoming events culminate at 8 p.m. in the Nutter Center with the much-anticipated Jason Derulo concert. Five years since his debut on the pop music scene, Derulo has sold more than 40 million records worldwide. His latest song, “Wiggle” featuring Snoop Dogg, is his eighth song to reach the Top 10 on the Top 40 format and his ninth platinum-selling single. Tickets can be purchased on the Nutter Center website. The concert is sponsored by the Wright State Division of Student Affairs, the President’s Office and Alumni Affairs. 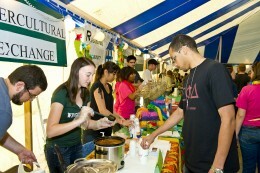 A highlight of Homecoming Week is the annual Chili Cook Off at 4 p.m. at the Rinzler Pavilion. On Saturday, Oct. 4, Homecoming Week comes to a crescendo. From 10 a.m. to noon, join the Student Alumni Association for the Nearly Naked Mile. Attendees will take clothes off their backs and give them to those in need by running around campus “nearly naked” for a worth cause. The event collects clothing for the Goodwill Easter Seals Miami Valley. Following the run, shirts will be given out and food will be provided. 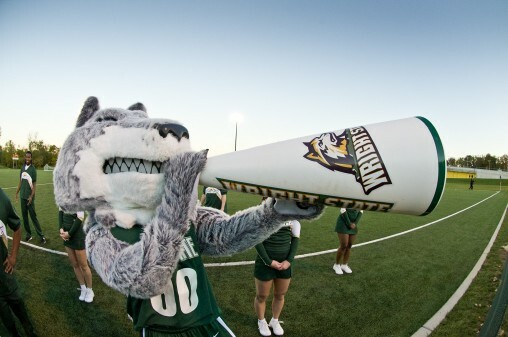 From noon to 6:45 p.m., enjoy a variety of activities at Wright State’s Rinzler Field. Play plinko for Wright State gear, try your skills through the AROTC maze, shoot some hoops with Pop-a-Shot, hit the alumni beer tent and visit with other students and alumni. The Wright State club football team takes on Ohio State at 1 p.m. The alumni softball game begins at 2 p.m. at the Alumni Field. The women’s soccer game begins at 2 p.m. when Wright State takes on Green Bay. Then at 7 p.m., the men’s soccer team takes on Milwaukee. Both soccer games will take place at the Rinzler Pavilion. From 4 to 6:45 p.m., grab some chili at the annual Chili Cook Off. Register for the cooking competition on the Office of Student Activities website. Homecoming Week culminates with the Homecoming Dance and Casino Night at 9 p.m. in the Student Union Apollo Room. Stop by and play cards or hit the craps tables. Or take to the dance floor and boogie down with friends, family and alumni. The event is hosted by the Residential Community Association and will go until midnight. To see a comprehensive list of Homecoming Week events, visit wright.edu/homecoming/events or contact Alumni relations at (937) 775-2620 or alumni@wright.edu.